Over the holidays, I experimented with lots of dishes using various ingredients and vegetables. One of the pending tasks on my list was to use the recipes that my mom had left for me when she visitited us 2 years ago. There were quite a few recipes as she used to teach cooking classes in India. As I was going through them, I realized the measurements and instructions were very confusing. Also, what made it more complicated was the measurements were in metric. But it is not the metric system that confused me (since metric units are much simpler) but the directions and quantities used. I had to make quite a few adjustments to the recipe in order for it to come out tasting the way it is supposed to taste. Even after that I messed up quite a few dishes. One of the ones that I messed up was a dish that used Tapioca. One of the steps in cooking Tapioca is to soak in just enough water for a few hours so it expands. I even called my mom to confirm the directions. Even after that, when all was said and done, the dish came out looking like a sticky, gluey mess. I tasted it and it did taste good as far as the spices were concerned but did not look anything like how it should be. This is one ingredient and recipe that is still confounding me. I cooked it twice with a few variations and it still came out a gooey mess. Agggghhhh. Well, if any one of you readers have any tips in how to soak Tapioca so it does not come out sticky, please leave me a comment. Having said that, I am going to try it again and not repeat my previous mistakes and see if it comes out. 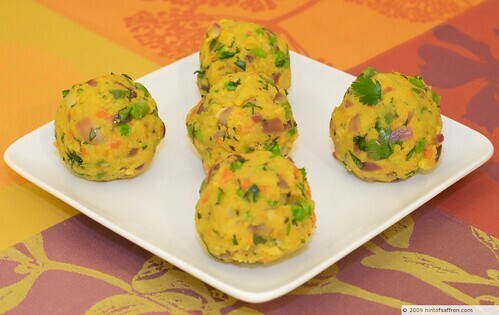 Moving on to the cutlet recipe, I believe, this is another dish that originated from the street vendors in India. 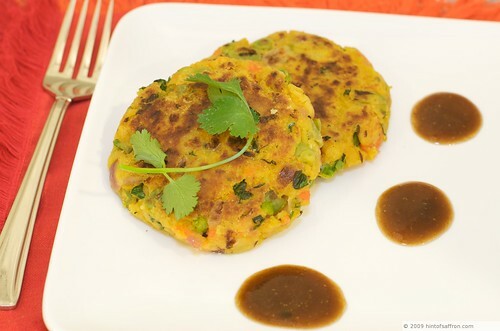 It is very easy to make and tastes really good with either ketchup or tamarind chutney. I will post the Tamarind chutney recipe soon. It is a quick and easy dish too. Heat the oil in a pan on medium-heat. Add the cumin seeds. Once the cumin seeds are slightly browned, add the onions and fry them till they are translucent, 2-3 minutes. In a medium bowl, mix the mashed potatoes, blanched beans and peas, grated carrots, fried onions, chopped green chilies, cilantro and bread crumbs. Add coriander powder, red chili powder, turmeric powder, salt and juice of half a lemon. Mix well either with your hands or a spoon. I prefer to mix with my hands to make sure it is mixed well. Taste and adjust for salt. Divide the mixture into 8 – 10 portions and form balls and then form patties by flattening them in the shape of a burger on your hand. Heat a non-stick pan and fry 4-5 patties in a tablespoon of oil. Brown them on both sides. Eat them with either tomato ketchup or tamarind chutney.